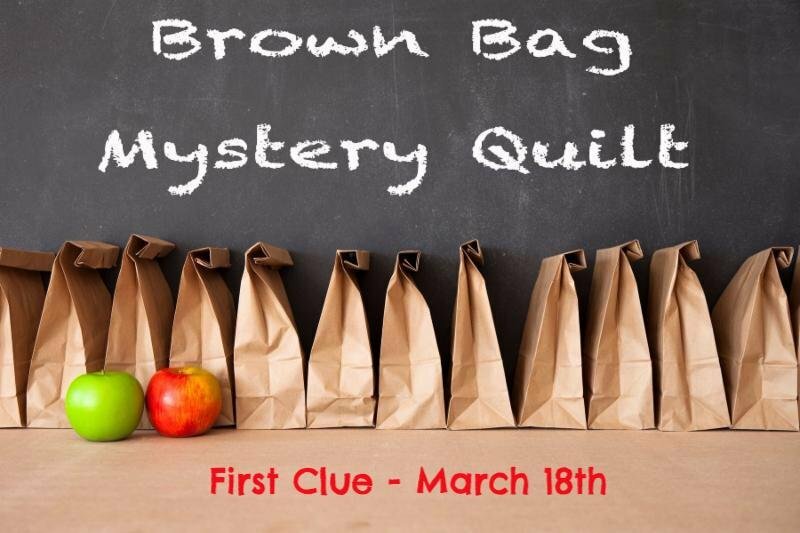 Another fun Brown Bag Mystery quilt by designer Karen Montgomery. Guaranteed to keep you guessing until the end, yet simple to piece, this kit contains 6 fabrics for a total of 6 yards of fabric to make the 48" by 72" quilt before optional borders. Packed in a brown bag, each cut of fabric is labeled for you and specially chosen to work well with this Check Please! design. A strip of fabric is tied in a bow to the bag handle as a hint to what will be inside. If you like the bow, chances are good you'll love the quilt! Included in the bag are the cutting instructions to get you started. If you prefer to have clues mailed to you, there will be a $ 10 fee for postage and handling. Clues that are mailed will be sent on that Saturday. This is a nationwide event - you will be invited to the private Facebook group for participants and shop owners only so you can share the progress of your quilt, ask questions or share tips you've learned while working on your quilt.